The Buchanan family tartan can be traced back to this Scottish clan’s roots in Loch Lomond in West Central Scotland. The Scottish clan of Buchanan lays claim to the lands surrounding Loch Lomond. These are claims which go back as far as 1225, when the Earl of Lennox granted Sir Absalon of Buchanan the grounds. This clan and indeed its family tartans have mixed roots, including in the clergy, as Sir Absalon was considered to be a ‘clericus meus’ or a clergyman. Before this, the name goes back much further and even across the water to Ireland, and a son of the King of Ulster who came to Argyll in the early 11th Century. He was then awarded the lands of Buchanan, thanks to his great services against the Danes. In history, the Buchanan family were known for supporting the Bruce in the battle for independence. This ensured the predominance of the family long after the battle of Bannockburn. It’s also thought that the Buchanan shield, which is virtually identical to the Royal Arms of Scotland, only differs as an allusion to the marriage of Sir Walter Buchanan to the only daughter of Murdoch, Regent of Scotland at the time. The Regent was beheaded by his cousin, King James I, who also confiscated his lands and disinherited his family line. The change in coat of arms and shield is the fact the double treasure of fleur de lis is black rather than red in the Buchanan shield, thought to signify the mourning of this loss. 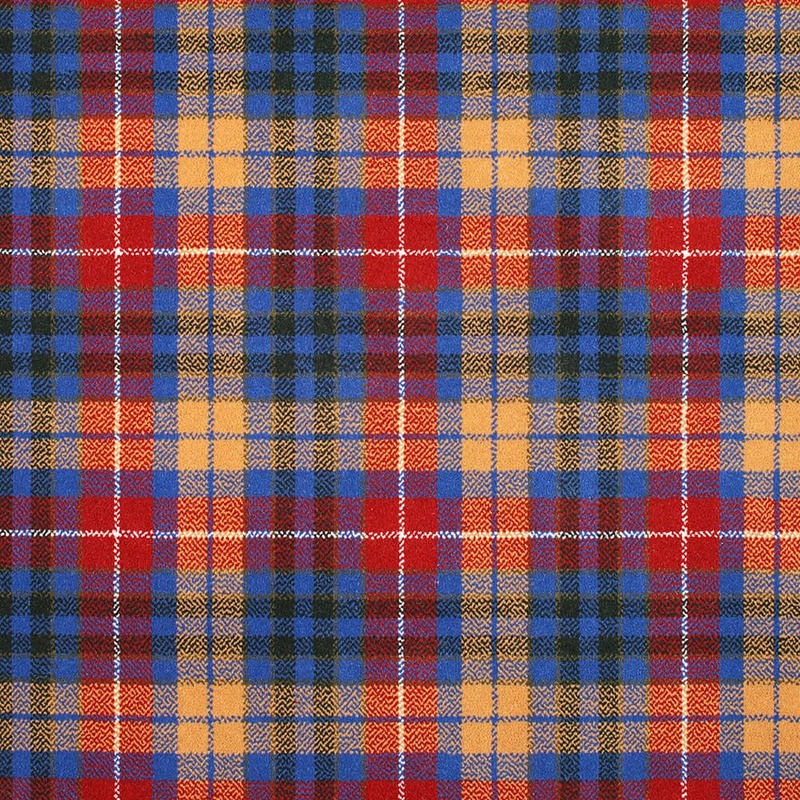 With such a tumultuous history, this clan tartan is full of different colours and flavours. There are elements of red, white and blue, owing to their almost regal status, as well as green and yellow checks which pay homage to their Celtic roots. The tartan, and the Scottish clan, still have presence in the east site of Loch Lomond to this day.